On each of my forays to the garden centre, one plant keeps catching my eye – a Mahonia (not literally as they are very prickly and that would be rather nasty). I guess it’s the time of year when the nurseries have them on display being winter flowering plants. I’ve ummed and ahhed and ahhed and ummed over whether to get one for myself. They have a kind of exotic look to them although I wouldn’t call it ‘tropical’ per se. However, the more I considered getting one, the more I realised it was on my mind and the only way to stop thinking about it was to just get one. 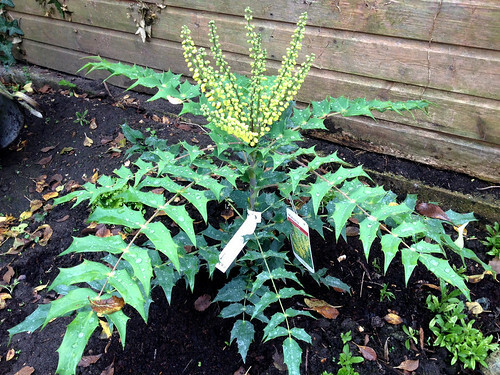 So now I have a mahonia! My variety is called Mahonia X Media ‘Winter Sun’ and after a bit of research, I discovered that Mahonias are shade loving and would be ideal next to the shed which is in shade for most, if not all of the day. They also grow quite tall which is good for me as I wanted something to obscure the shed from that side. 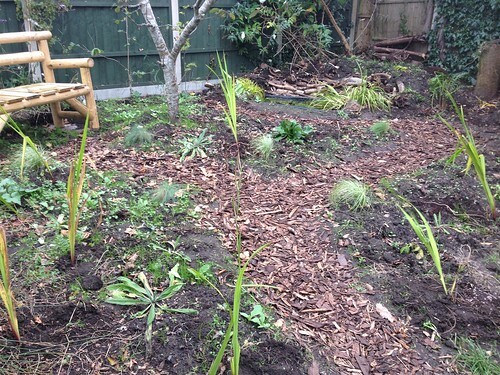 Earlier this year we were given some Nerine bulbs. They were unlabelled but grew into foot high plants with white spidery flowers. I’m not sure but I think they are probably the Nerine bowdenii Alba variety. Potted up together in a planter, they looked OK but I think they really needed to be in the ground dotted around rather than in a clump so they can contrast with other plants. I’ve put them in. I’m not sure if it’s a permanent home for them, I’ll just have to see how they look next year.